See, this is why the Hazmat suit makes for the perfect outfit for a con. – Stops you getting sick. – Gets you into the places you can’t normally access. – Makes for a decent cosplay. Before loading up the responses, I was just thinking that Fen should start a GoFundMe so that he could buy a hazmat suit to wear to cons, lol. Is the upgraded (by Dr. Badger) Siegewulf supposed to be able to tease you when unequipped in one’s inventory? Bleh sinus infections are the worst, every friggin step you take it’s like your teeth want to jump out. You thought they meant content? wait, you aren’t supposed to be able to bet 2 million credits at a time when you already know you have a 21? Yeah, I got a real kick out of that, lol. Can you imagine how fast a casino would go out of business if they let you change bets mid-game? Everyone would just bet the minimum entry, wait until they had a winning hand, and then bet everything they had, repeat until casino is broke. 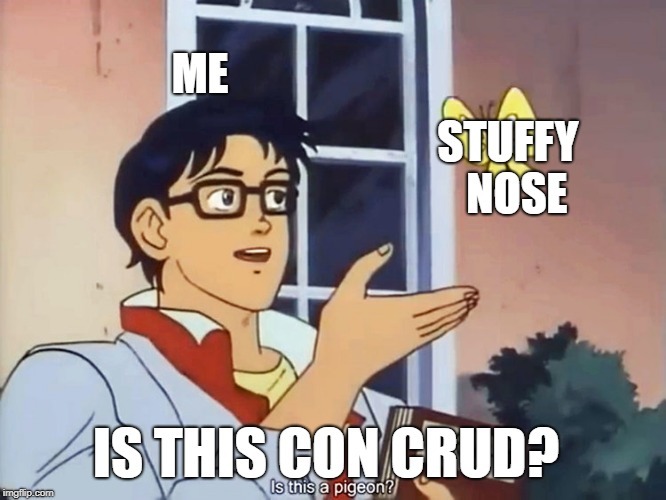 I’m annoyed you called it Con Crud and not Con-tagion. You had the opportunity for some choice word play and you blew it! Along with his nose? Lol. Always boost your immune system prior to a Con and flying on an airplane. If I had an immune system as wimpy as Fen’s seems to be, I’d never step foot on a plane without wearing a dust mask to reduce the chance of infection. looks like fen slipped up on his regular payments to papa Nurgle and now he comes to collect with interest.